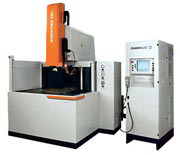 The Charmilles 550w/GAMMA TEC CNC is the normal conventional EDM machine that everyone is used to, but with the capabilities of polishing. The Charmilles 550 will give you a RMS finish of 4.9 with a copper electrode and a 12 with a graphite electrode. This is half of an aluminum mold and the electrode that was used in Northeast�s Charmilles 550 Gamma Tech to get the customer�s required 12-16 finish. This machine has the capabilities to give you a perfect mirror finish, and will make hand polishing a thing of the past.